Typically needle-punched for maximum permeability, non woven geotextile fabric provides strength and permeability for a variety of different landscape and drainage applications. Geotextiles are designed to improve soil stability in your landscaping project. These man-made materials are created with polyester or polypropylene. In this post, we will discuss the various differences between woven and non-woven geotextiles. But first, geotextiles offer 5 different purposes for high performance. Woven Geotextiles are made by weaving narrow strips of film together in order to provide reinforcement and separation. These geotextiles are often referred to by tensile strength that will not break down under pressure. Woven fabrics are somewhat plastic-like in appearance and in touch. They are mostly impenetrable and will not provide drainage. Woven geotextiles do have the capacity for very high loads and are normally used for road and parking lots. They are used for separation, filtration, and drainage. The fabrics are created using needle punching vs weaving. Non-woven are referred to by weight and appear and feel like felt in texture. They are penetrable and are normally used for drainage applications and filtration applications. Using the correct geotextile in your landscaping project will increase its lifespan and improve your overall design. You will be less likely to end up with callbacks due to drainage issues or settling if you apply the correct product for the project. If you are not familiar with french drains, you probably don't know when they are the best choice or how to install them. If you have a neighbor whose land sets up higher than yours, you will probably have excessive water or moisture on your property. Water could easily run down from their property and land in your yard. Therefore, you are going to need a really good drainage system for your yard and the installation of french drains is an excellent option. 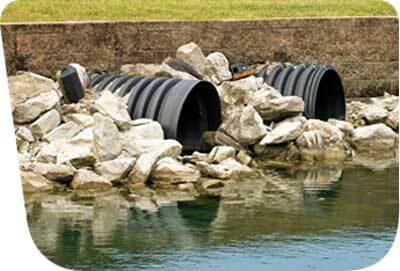 In some cases, people will call a drainage system as a French drain that is a drain pipe and then filled with gravel. That said, the French drain is basically filled with gravel but there is no pipe involved. The term “gravel” can vary from one place to another. In this article, gravel is an aggregate of small stones. First, find the area on your property where excessive water is accumulating from the slope and be rerouted. Your options will be determined by where the water is being rerouted to. Obviously, if water is flowing toward your home's foundation and this water will harm your foundation, then you need to find a place to move this water to quickly. The perfect french drain location should be an out-of-the-way area that has sandy soil where water can travel harmlessly. Keep in mind that the area you choose to reroute the water should not impact someone else's property. If your french drain does divert water to someone else's property you could be looking at a lawsuit so be careful! Also, you need to check your city codes before attempting to dig and check with your utilities to know where your underground cables are located because you can't dig there. Locate your local Dig Safe phone number to make sure you will be excavating in a safe place. Ideally, you want to run your french drain along the slope on your side of the property line. You want an area that does not have obstacles or obstructions. Before starting to dig, you should layout your french drain area. You will have to create a small slope in order to carry the water to its final destination. A grade of 1%, which is a drop of one foot per every 100 feet in length, is highly recommended. Some will advise a drop of 6-inches for every 100 feet. It is essential to get the water to flow where you want it to in order to improve your yard's drainage and therefore the grade will help in your efforts. Place two stakes into the ground that will mark the beginning and the end of the trench. Tightly tie a string to one of the stakes and then run it to the other stake and tie if off but loosely. Attach a string level to the string and adjust the string to get it level. Once it is, tighten the string on the second stake. You want to ensure the string is taut. Now you can start digging your trench. While digging, you will be able to measure down from the string to ensure that you are getting the desired grade. Check your depth as you go along. If your trench is at the proper length, 100 feet and grade 1%, once you have reached 50 feet, your trench should be 6-inches deeper than from where you started. The hardest part of the french drain is the digging which is a horizontal trench that goes across the length of the slope. Your trench must slope down to the area where you will have the water rerouted and if it doesn't make it to the chosen spot, you will have to dig a connection ditch which will be added work. The width of your trench will depend on the level of water issues you have. Obviously, the more water, the wider the trench will have to be. Smaller trenches are normally around 5 to 6-inches. 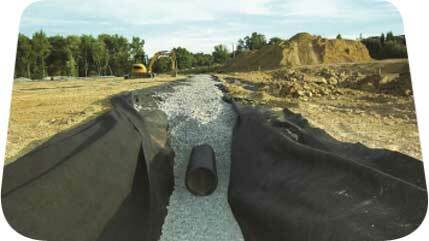 Before you place your gravel fill, make sure your trench lines up with the fabric. 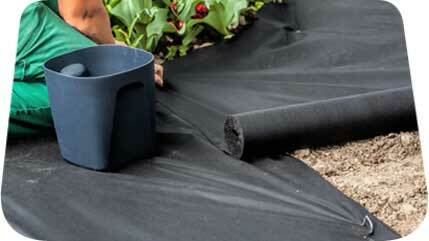 Your landscaping fabric will prevent dirt from getting into the gravel. Your gravel needs to be protected so it can permeate the water through it. This is critical in order for french drains to operate properly. Place coarse gravel onto the fabric then fold the ends of the fabric over the gravel. Once done, you will have a tube of fabric filled with gravel. To fill in the rest of the trench, place a layer of coarse sand and then cover that with landscaping fabric. Then add 4-inches of topsoil and place sod on top of it. Your drain will be completed. If you are having difficulty getting the proper grading, it's highly advisable that you consult with a surveyor or someone who knows how to carry out the entire project. Also, if the idea of digging the trench is hard to do, hire a backhoe operator. This will add to your costs along with the cost for added gravel because a backhoe cannot dig a small trench like one can do manually. Another alternative is renting out a trencher which can cut very thin trenches. Keep in mind, if you can use a small trench for your drain, you will save quite a bit of money and will require a lot less gravel. The most difficult process involved in a french drain is figuring out where to run the water. If possible, the best avenue is to run the water out to the road where the city's drain system will deal with it. That said, you would have to research to find out if this a good avenue or not. Another alternative might be a dry creek bed for placing your drain to solve your problem.